"If we didn’t have controls, we wouldn’t have a fishery to speak of—recreational, commercial or tribal," says Marc Gaden, communications director for the Great Lakes Fishery Commission. "Beyond that effect, they would destroy the ecosystem from the top down." Nick Schloesser, a recent University of Wisconsin-La Crosse graduate who is also a U.S. Geological Survey biologist, is adding to the body of knowledge to protect the world’s largest collective body of fresh water from the bitter bite of the lamprey. He shared his finds related to using Environmental DNA monitoring to help control populations of lamprey in December as part of his UWL master’s thesis project. "This (eDNA monitoring) is certainly state-of-the-art and something the fishery commission is interested in," says Gaden. It could save money and time in assessing streams and rivers to determine where to control lamprey, he adds. Schloesser's research opportunity and student-scientist status came about because of a long-term cooperative educational agreement between UWL and USGS Upper Midwest Environmental Sciences Center, located on French Island. Schloesser's master's project leveraged his experience as a UWL graduate research student with experience working at USGS. His graduate thesis project aimed to provide more guidance in determining the location of sea lampreys to save budgets and time. 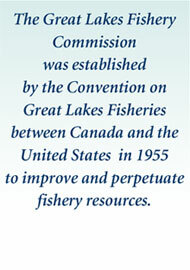 To control sea lamprey, Canadian and U.S. 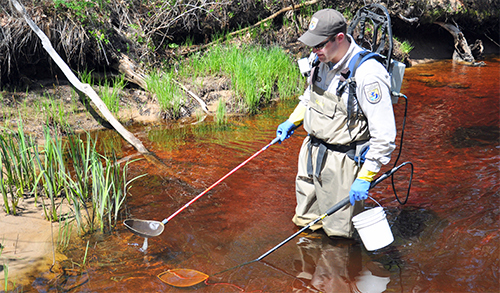 Fish and Wildlife Service biologists begin by assessing tributaries to determine which ones contain larval sea lampreys. Lamprey are constantly sloughing off cells from their bodies, leaving remnants of DNA—called Environmental DNA—in river or stream sediment, says Schloesser. Through his UWL research, he found Environmental DNA monitoring could potentially be one more tool to determine the concentration of lamprey in a particular stream. Schloesser's finds could save time, money and effort as the typical method for monitoring sea lamprey is physical monitoring, says Hines. "eDNA allows for that rapid screening—doing more waters, more efficiently," says Hines. "It definitely serves a big need from a national and international perspective." Nick Schloesser's research project is a product of UWL's long-term Cooperative Educational Agreement with the USGS Upper Midwest Environmental Sciences Center. A partnership between USGS and UWL's River Studies Center started back in the 1970s, allowing UWL students to conduct research with USGS scientists focused primarily on river science and fish health. Today the partnership encompasses a variety of UWL disciplines. 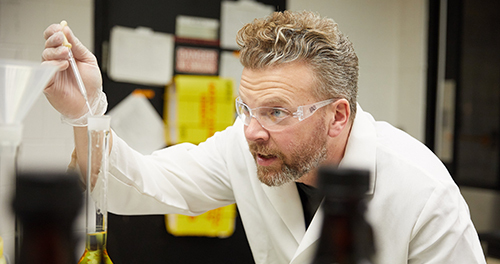 Hines says the collaboration brings strength to their team of scientists through professional interactions with UWL faculty. It also helps them attract talent as many of UWL's undergraduate and graduate students transition into full-time work at USGS.